At BBK we believe that simplicity is part of the joy of kayaking, so we offer only time-tested reliable accessories to compliment our kayaks and paddles. Custom made for BBK by a nationally-known sprayskirt designer to ensure a watertight seal on our cockpits. 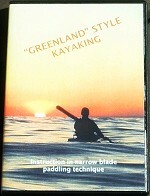 An instructional DVD by Doug VanDoren, widely recognized as both a fine practitioner and effective teacher of Greenland paddling technique. The focus of this 39 minute DVD is the forward paddling stroke, the sweep stroke, draw, bow rudder, stern rudder, low and high brace, reverse paddling, and low brace turn.